Join us for a Picnic in the Park this Thursday! 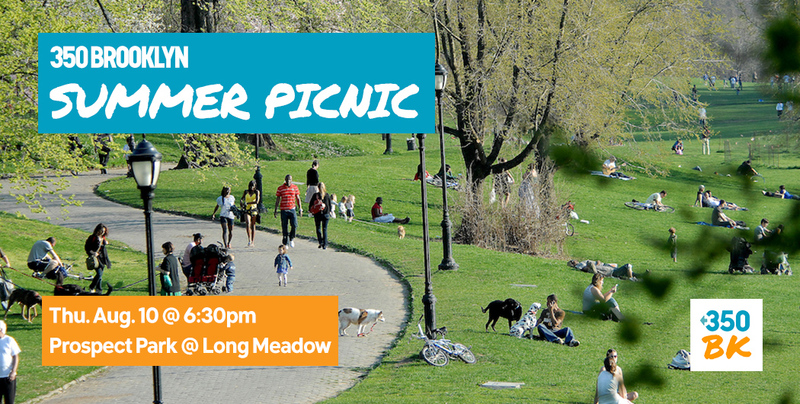 Relax and have some fun in Prospect Park with a potluck picnic on Thursday, August 10. (Not August 11 as stated in previous newsletter.) Meet at the end of Long Meadow nearest Grand Army Plaza at 6:30pm. Bring your family, friends, and something to share! Instruments welcome, too. Our regular monthly meetings in Brooklyn Commons will resume on September 14. If it rains: We’ve got a backup plan for an apartment nearby. Call 718-344-5835, 718-638-4876, or 212-414-5857 for details. 350Brooklyn, in partnership with Brooklyn College, will be hosting a town hall event in October for New York State representatives to hear from you, their constituents. As we commemorate the Fifth Anniversary of Superstorm Sandy, we must face the climate emergency head on and make sure our communities are resilient. And New York must be an international leader to build our renewable energy future. Put a Price on It! Sign our letter to Governor Cuomo telling him it’s time to put a price on carbon. After a long campaign, last January Governor Cuomo committed New York State to develop offshore wind by 2030. Now the New York State Energy Research and Development Agency (NYSERDA) is conducting public hearings, and needs to know how much support there is among Brooklynites for offshore wind. NYSERDA will hold three hearings. The Coney Island hearing will be on Wednesday, August 16 at 6 pm. It will be in the Education Auditorium of the New York Aquarium at 602 Surf Avenue at West 8th Street. A big crowd at each of these hearings will solidify our support for this crucial step in moving us off fossil fuels. Email infrastructure@350brooklyn.org if you can help push for offshore wind. On Thursday, August 10 Goldman Sachs is holding a conference for pipeline builders. Got coffee? 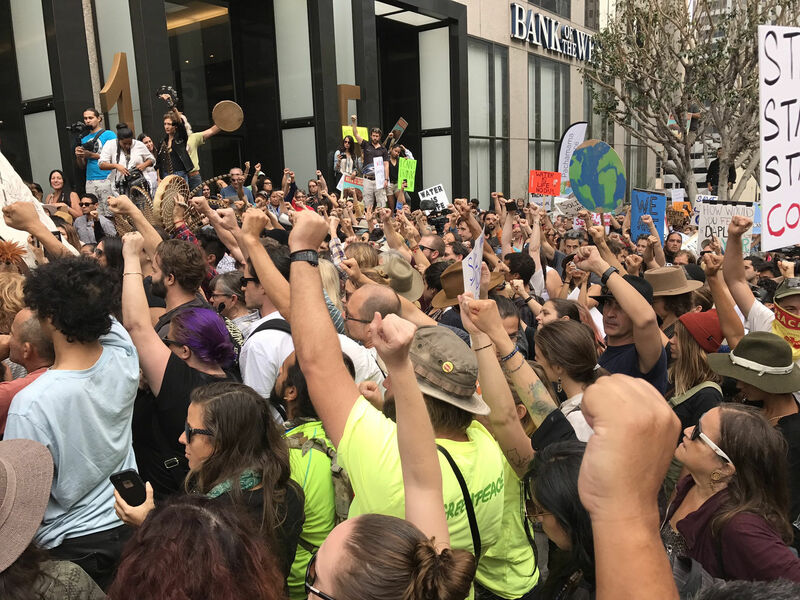 Activists from all over the city will be converging on 200 West Street, the global headquarters of Goldman Sachs, at 8:30 am. We’ll greet arriving attendees and show them just what we think of their pipelines! Williams, a pipeline construction and operating company, is proposing to lay a 23-mile fracked gas pipeline across Lower New York Harbor from Raritan Bay in New Jersey past Staten Island and Brooklyn to a point off the Rockaways. Digging a trench for this pipe will churn up toxic chemicals and cost just short of a billion dollars. 350Brooklyn has formed an alliance with Sane Energy project, the NYC chapter of Surfriders, Food & Water Watch, and NY NJ Baykeeper to stop this pipeline. We’re hard at work alerting Brooklynites to the dangers of this pipeline and pushing Governor Cuomo to deny the required permits, but this is just the beginning. Email infrastructure@350brooklyn.org to get involved. Brooklyn’s first Civic Fest was held at the Prospect Park Bandshell on July 25 with a crowd estimated at 1,500. 350Brooklyn was there alongside an impressive array of progressive organizations and great performers like the stompin’ Gowanus Wildcats. Three dozen people signed up for our newsletter and more signed our Carbon Tax letter to Governor Cuomo.